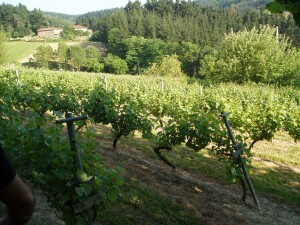 Uriondo vineyard in Zaratamo Spain. Source: De Maison Selections. As regular readers know, I write a free, twice monthly wine column that’s distributed to newspapers across the country. These columns are hosted by Grape Collective. If you don’t see my column in your local newspaper, please send an email to your paper’s editor and CC me (David – at – Terroirist.com). In my latest column, I explain why Txakolina — a slightly sparkling white wine from Spain — is the perfect wine for summertime drinking. For wine enthusiasts, finding the perfect summertime match can be daunting. With wine, simple has become synonymous with cheap — and serious oenophiles steer clear of mass-produced plonk. For outdoor entertaining, though, the good stuff is typically too expensive — and too fussy. Just as no one sniffs and savors a PBR, it’s nice to enjoy a glass of wine every now and then without taking things too seriously. Check out the rest of the piece on Grape Collective!